An absolutely perfect change for summer, this Vodka, Limoncello, and Prosecco Sangria with Raspberries is light, cold and so refreshing! For all the combinations of wine, liquors and liqueurs that I love I’ve never been particularly fond of Red Wine Sangria. I think I had some once that had a wine that was too heavy or the entire batch was too heavily spiced. Then one day several years ago I discovered a recipe by Bobby Flay for a White Peach Sangria and it was a revelation. Lighter, more fruit forward and with the fruits of summer, the perfect cocktail for having friends over for a summer barbecue. I’ve made that Flay recipe often but last year I tried my hand at a bit different mix of ingredients and this White Peach and Bing Cherry Sangria was so good that I’ve been encouraged to keep on experimenting in that direction. This year I switched it up a bit again and instead of a regular white wine I used one of my favorite mixers; an Italian Prosecco sparkling wine. Filled with fresh fruit and a citrus simple syrup, this Vodka, Limoncello and Prosecco Sangria with Raspberries is light, pretty and a great fun beverage for a gathering of friends. 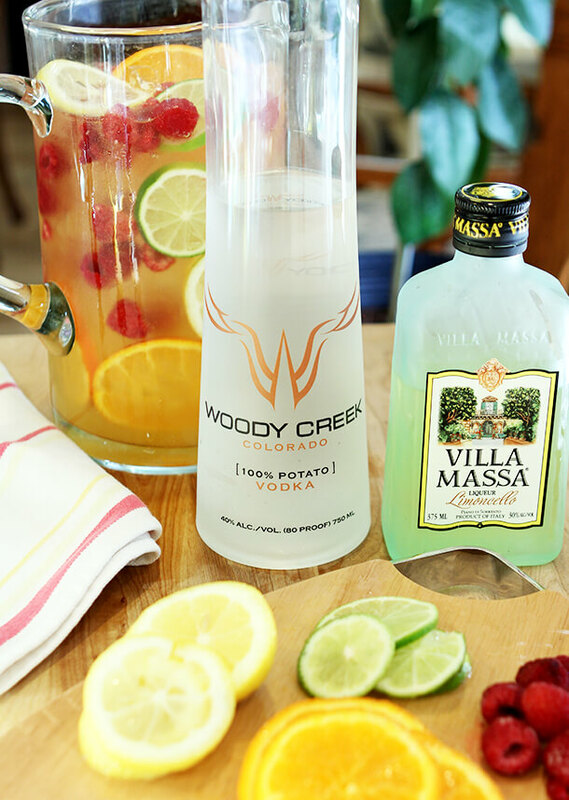 Making this Vodka, Limoncello and Prosecco Sangria with Raspberries brought together two favorites; Woody Creek Vodka, a potato vodka from Colorado and Villa Massa Limoncello from Italy. While I will make my own Limoncello, when asked to try this product I knew it would be good; Italy’s Limoncello is the standard bearer and I can’t deny, it’s better than mine! 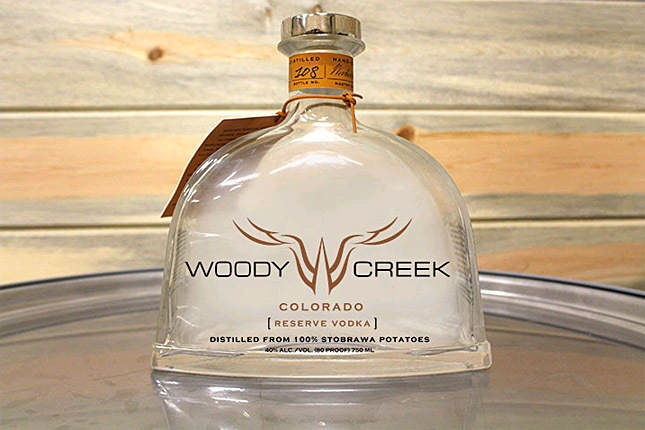 The vodka from Woody Creek Distillers (WCD) is 100% Potato Vodka made with alpine potatoes grown on the Woody Creek Farm located 8 miles from the distillery in the Aspen Valley in Colorado. After two years experimenting with different varietals, in May 2012, Woody Creek Distillers planted its first commercial crop of potatoes, the first commercial crop in the Aspen Valley in approximately 75 years. After a plentiful fall harvest of more than 500,000 pounds of potatoes, in Sept. 2012 WCD began distilling in its Basalt facility. Since WCD Signature and Reserve vodkas are made from potatoes, they are gluten free and WCD does not add any additives or flavors to the spirits. WCD also does an intense clean between batches and are confident there is no cross contamination of ingredients. Great news for my GF friends! I loved this vodka and highly recommend you try it if you can; it does have limited distribution, mostly in Colorado, Kansas and Tennessee with one location in New York. 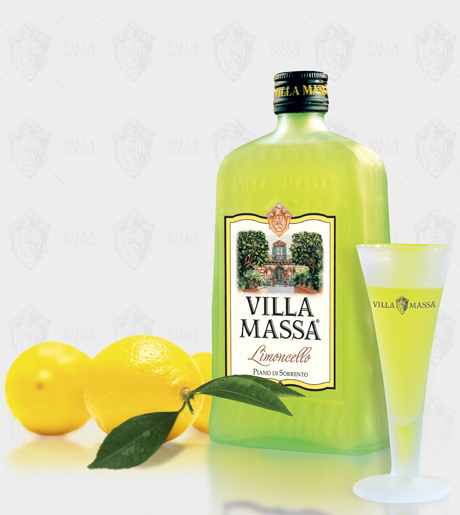 The Villa Massa Limoncello was the perfect partner with this vodka. Have you ever had Limoncello? It’s addictive; an excellent digestif if served cold, Limoncello is also fast becoming one of my favorite mixers and the quickest cocktail I use it for simply mixes it with cold Prosecco; undoubtedly the inspiration for this sangria!The two together? Really a perfect pair! Juice 2 oranges, 2 limes and 1 lemon to measure approximately 1/2 cup of juice. Combine the citrus juices and the sugar in a saucepan and warm over medium heat until the sugar is dissolved. Cool. Thinly slice the remaining orange, lime and lemon. 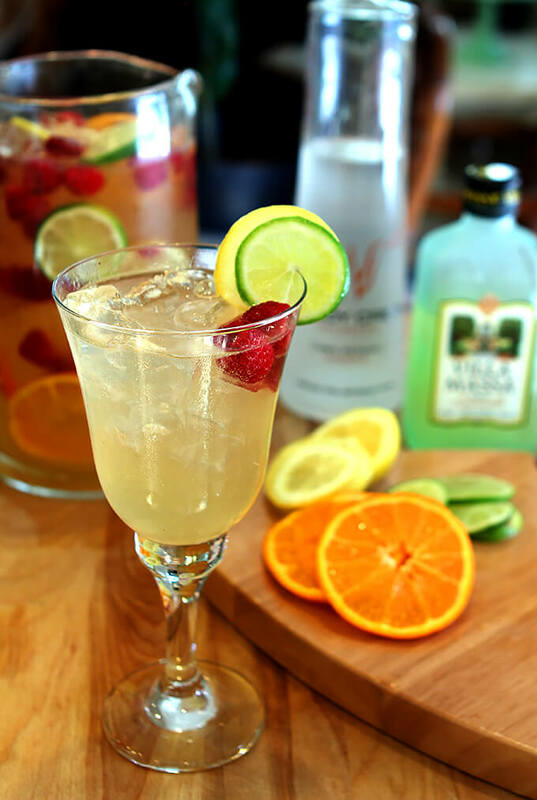 In a large pitcher, combine the ice, citrus slices, raspberries, vodka and Limoncello and stir. Top with Prosecco; stir gently and serve; garnish with fruit if desired. I was provided with samples of the Woody Creek Vodka and the Villa Massa Limoncello however all commentary is my own. 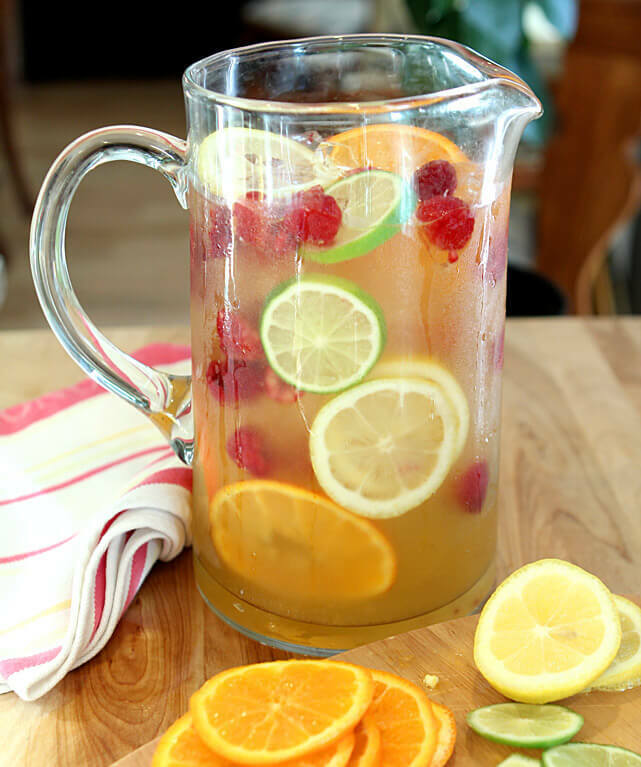 Hi , can’t wait to try this recipe tomorrow on my family, I just want to make sure I get it right….the citrus juices and sugar make a simple syrup I add to pitcher with other ingredients ?? Thanks for the heads up Jenn; I’ve modified the recipe to be more clear! Hi Barb. After reading through the instructions, I noticed the same thing Jenn did. It does not say what to do with the simple syrup after it is cooled. When do you add it to the pitcher? Step #3? Thanks! Shoot…thought I fixed that! Let it completely cool and then mix it with all the other ingredients except the Prosecco. I’ll go fix it now…thanks Nikki! I am with you. I much prefer white wine sangrias to red. I love to sip red wine as is, and I really only drink white in sangria form these days. I adore prosecco – so I know I would love this!! I still want to try making my own limoncello, I know its easy to do – I just need to do it! Limoncello is a bit more of a pain than liqueurs made by steeping fruit; peeling them is not fun…but not hard. SO worth it though. I think that is the prettiest Sangria I have ever seen! And knowing your drinks, I know it is Delish! A glass of this and a glass of that peach sangria and I’d be set for some double-fisted goodness. I love field trips and even more so if they involve Aspen. We used to spend a lot of time there and I miss it. This looks super, Barb! I am so ready to porch sit! This drinks looks like it will welcome summer and then enjoy the nice weather and time with friends for the weeks to come. I will definitely share this with company– I like the idea of making one pitcher rather than individual cocktails, much more manageable for me. Simply beautiful, Barb! I do like red sangria, but have had (and alas, have made) some pretty awful concoctions. Too easy to add too much stuff. Most white versions don’t make that mistake, and yours sure hasn’t. This looks wonderful! Loads of flavors, and love the highlight on the lime slice in the top picture. Thank you posting this today! I know you said you were tired last night, but I was secretly hoping you’d muster the energy to share this. I have to make this today. It’s been one of those weeks. Thanks Barb! You made my day! I gave out last night when my laptop battery died but promised I would do it for today. I SO need to get ahead don’t I. Think I’ll make next Friday’s cocktail today!